One of the most common questions I am asked about chaplaincy is, “what exactly do you do at the track?” So I invite you to spend a few days in my dusty boots as I served the NASCAR Camping World Truck Series at Eldora Speedway in New Weston, Ohio last week. 5:00pm and it’s time to shut the computer down for the day. Shutting down this early the day before a trip is definitely an oddity. Typically my pace prior to leaving for an event falls somewhere between frantic and ‘did that guy just drink 20 cans of Red Bull?’. It is a day that is full of prep for the upcoming event. Preparing Chapel flyers and bulletins. Reviewing schedules. Packing. Double checking travel arrangements. I did overlook booking my hotel, which seems odd since my ‘other job’ is with a travel agency. 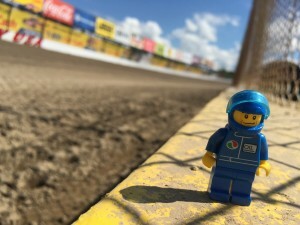 Nevertheless, the best I could do at the last-minute was to reserve a hotel in Dayton, OH; about an hour and fifteen minutes from Eldora Speedway. Along with all of my pre-event prep work I am normally abustle with responsibilities with my other job and on the home front. I never want my family or my work with the travel agency to get ‘leftovers’ so I work ahead as much as possible. 5:30pm and I decide I need a pair of boots for the dirt track. Since the majority of my work is on asphalt my feet felt completely unprepared for the new terrain, so we load up the car and venture out to find me some new boots for the trip. 9:30pm and we pull into the driveway empty handed. After a four hour trek across Franklin and Brentwood, running in and out of shoe stores, I remembered that I really am extremely picky about my shoes. I also realized I neglected to go to FedEx and print the chapel bulletins. Oy. 11:30 pm and the kids are wound down and it is finally time for bed. My flight is scheduled for 5:30a which means a 3am alarm for me. Every minute counts! All four of us climb into our small queen size bed together as we always try to do the night before I leave. 12:30am and I didn’t last long in the crowded bed. The couch looks like a great place to get another two and a half hours of sleep. 2:00am and I am awakened by a text message. A friend from within the race community text me to be sure I woke up for my flight. He didn’t take into account the time zone change. I still give him a ‘A’ for friendship and effort! 3:00am and I have to wake up for real this time. After stumbling around the house half asleep trying to get ready, I realize my keys are missing. A frantic search finally reveals they were in the bed. I am still not sure how they got there. I guess they weren’t ready to get up either. On the way to the airport I ‘energize’ myself with some worship music and prayer time before stopping off at a 24 hour Kinkos to print my flyers and bulletins. 5:30am and I made my flight. 11:30am and after a nap, a groggy layover and another nap I think I am in Dayton. I make my way to Hertz to pick up my car, make a call home to check in with Michelle and then I’m on my way! 1:15pm and I survived my drive through the cornfields of the Midwest to find Eldora Speedway nestled into the New Weston, OH landscape. There is always an awkwardness of arriving at a track for my first time ever. Typically that akwardness comes from not knowing where to park or where to go. I threw my car into the first lot I saw and away I went. The only problem was I didn’t know where ‘away’ was. So I roamed. About thirty minutes into my wandering I must have really looked lost because eventually an elderly lady stopped me and asked if I was looking for something. 2:00pm and I’m finally in the track! The garage is now open and everything is ‘busy’ with activity. Tuesday is a ‘tech only’ day and there is no scheduled on track activity for the NASCAR Camping World Truck Series. I take a few minutes to walk around and familiarize myself with my new ‘home’ for the next two days. Thankfully it isn’t as muddy as I thought it would be…these shoes will do fine! The next three hours are filled with conversations around the garage with different people. From NASCAR officials to fans, from crew members to track workers, I am encourage by the amount of people who want to engage in conversation. Life. Work. Family. Racing. Jesus. Some conversations are friendly some conversations are eternal. No topic is untouched. I’m sure you’d like to hear all of the juicy details…but you won’t hear them from me! A lot more happens in this time than what it sounds like; but for privacy you’ll just have to trust me! 5:00pm and the garage is now closed for the day. It was a short day in the garage, but a lot was accomplished! I make the hour and fifteen minute drive back towards my hotel and grab dinner along the way; another quiet sit-down meal alone. Sometimes traveling can be very lonely. Once back at the hotel I make another call home to check in with my family and catch up on each other’s day followed by a deep cleaning of all of the dirt I accumulated during the day. Afterwards my time is filled with another round of study for my chapel message and final prep for race day. Once I am fully prepped for the next morning I spend the next few hours catching up on work for the travel agency before drifting off to sleep. 7:00am and my alarm goes off. It was a full night’s sleep and I feel like a million bucks; ready to tackle the day! I’m off to Eldora Speedway for the #MudSummerClassic. 9:00am and I’m back at Eldora Speedway. On my way into the gate I stop off and spend some time catching up with the ladies inside the NASCAR Registration building. By the time I make it into the track the garage is open again and in full swing. I make an initial lap around the garage and quickly realize that my backpack has got to find a new home for the day. Usually I am parked where I have pretty easy access to my car, but not here. So my bag is fully loaded with anything I could need for the day. I stop off at one of the team haulers and ask if they have space for me to leave my bag and they clear out a cabinet for me; my own personal locker. My ‘thanks’ verge on the level of annoying as I continue to let them roll from my tongue; the team was gracious in making me feel ‘welcome’ in their space. I grab my chapel flyers from my bag and head on my way to start posting them up on haulers. Because of the tight infield at Eldora Speedway only about 1/4 of the haulers are opened at the rear, the rest are utilizing their side doors which left me walking in and out placing the flyers on countertops inside. I chuckle and wish them both an incredible day. 11:00am and I’ve finished distributing flyers. Practice is now well underway so I venture over to turn 3 to watch they on-track activity for a few minutes. I’d never been to a dirt track before so it was quite fascinating to me. Practice is never an extremely productive time for me as the noise prohibits most conversations so I grab myself a few chicken wings from the concession stand for lunch before making a visit to the Media Center to catch up with some of the media folks I’ve been getting to know. 1:00pm and practice has come to an end at Eldora Speedway. Drivers and teams are briefing on the practice session and then putting themselves into a flurry of motion to prepare for qualifying inspections. I decide to venture over into the grandstand area of Eldora Speedway just to experience the ‘venue’ as I’d been told it was very neat. I wasn’t in the fan concourse long before a fan stopped me and engaged in conversation. When he learned what my role was at the racetrack he chose to remove his hat for the remainder of our conversation. We had a great talk! After meandering through the grandstand concourses I worked my way over to the Autograph Session that was now underway behind the turn three & four grandstands. It was a good time for me to connect with the family members of a few drivers who were just hanging around as well as a chance for me to scout out the location we would be holding chapel later in the day. I eventually find my way back into the track and spend the next two hours again finding conversations with crew and officials as tech inspections for qualifying have begun. These conversations often define my time at the track; traversing the spectrum of faith and life I always enjoy getting involved in others’ stories. 3:30pm and I start to make my way out to the fan concourse again. 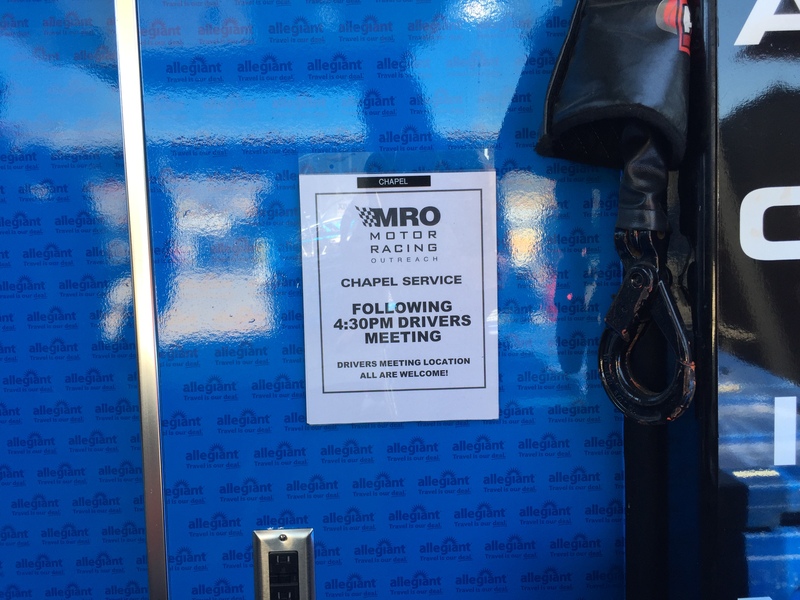 Our Drivers’ Meeting is scheduled for 4:30pm with Chapel to follow immediately after so I head out to begin to prepare. It was a gathering of fans to meet some different Twitter personalities including @TheOrangeCone, @NASCARCASM and @AnnoyingRaceFan as well as some NASCAR drivers. I hung around for a few minutes talking with the driver and watching the ‘Tweet-Up’ before heading over to the building for drivers’ meeting. 4:30pm and the Drivers’ Meeting is underway. The building was extremely crowded with both our NASCAR community and fans that have crowded into the back and side of the building to watch the meeting. As it comes to a close Elton invites me to close the meeting in prayer after which I announce chapel will begin in a few minutes. By the time chapel began we were only about 30 minutes away from the start of qualifying so I had to truncate what I was going to share. We had about 25 people from our community who were able to squeeze out the time to stick around and several dozen fans joined us from the back and side of the room as well. In chapel this year we’ve been exploring the questions Jesus asked us. This week we looked at when Jesus asked His disciples “what do you have” when they were confronted with the challenge of feeding 5,000 people. Jesus wasn’t concerned with what they didn’t have; rather wanted them to see that what they did have was enough. 6:30pm and Chapel and qualifying are behind us. I make my way to the back stretch to begin praying with drivers and crew guys as they prepare for their heat races. 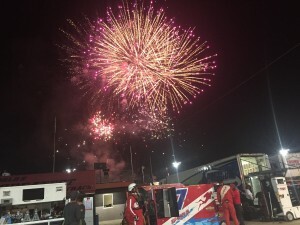 I have become accustomed to doing this just prior to the start of the race, however I was asked to do the invocation at Eldora Speedway that evening so my best opportunity was to connect during the heat races. “Yes ma’am, I did!” Her face beams as she walks back to her son’s truck. 8:00pm and I’ve made my way to the front stretch for pre-race ceremonies. The heat races are complete without any major incidents and it’s time to move on to the feature. I find my place for the pre-race ceremonies and am given my ‘final instructions’ prior to our going live on TV. Following a brief introduction from the announcer, a new friend I made during the day, I offer the invocation prior to the #MudSummerClassic. Evidently, a lot of friends were watching as my phone seemingly ‘blew up’ afterwards with kind comments. I was humbled by the kindness of others and thankful for another opportunity to connect with Heaven. 11:50pm and I’m back at my car. Thankfully there were no major incidents during the race, I didn’t need to make any trips to the infield care center Following the race I spent some time catching up with various people post-race; checking in after the events of the night. Typically this is a very busy time as teams are anxious to load up and get out the gate, but there were a few more conversations to be had. I made a final stop at the media center and made the trek back to my car on the other side of the track. 2:50am and I’m headed back to the airport. After sitting in traffic I made it back to the hotel at around 1:30am. I checked my pedometer, 30,000 steps today. I had just enough time to detox myself of a day’s worth of dirt and repack all of my bags before heading to the airport. It was a long day and my mind was still racing with all of the conversations and interactions. I was tired, yet full of gratitude for the time that I had. My tiredness was overcome by my joy to be heading back home to my family again. My days were filled with opportunities to testify to the goodness of God. While I can’t recount the people or the conversations to you out of respect for those relationships, my heart overflows with joy and excitement at the opportunity to serve God wherever He may lead me. Every event is different, as is every relationship at the track. Sometimes I am comforter and sometimes I am counselor. At times I am encourager and at times I am friend. In the end, my pursuit is to continue to make Jesus known while encouraging others to continue to move towards Him!